First introduced in 2012, the new 2014 Subaru Impreza 2.0i five-door sport limited has helped Subaru gain serious sales increases with it bold looks, refined interior, outstanding handling thanks to its AWD system, all for an economical price. Upgrades for 2014 include more sound-reduction measures for a quieter cabin, a standard rear vision camera for the 2.0 Limited models using the 4.3 inch LCD screen of the display audio system. Also, the optional navigation system in the Premium and Limited models gains Aha smartphone integration giving me access to the service’s radio stations, newsfeeds, audiobooks and more. To save consumers even more money, the 2014 Impreza has the highest fuel economy of any AWD car in the compact five-door segment. Its 27mpg/city and 36mpg/highway EPA ratings for models with the Lineartronic CVT transmission are comparable to some front-wheel drive compact cars. 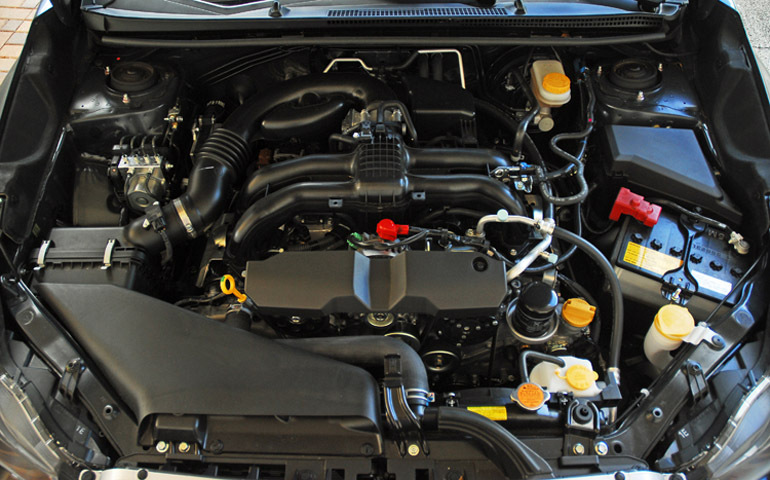 Peppy power comes from the 2.0 liter horizontally opposed BOXER 4-cylinder all-aluminum engine with DOHC’s and dual Active Valve Control system that controls valve timing on intake & exhaust camshafts, including tumbler generator valves that optimize low and mid-range torque. Mated to the Lineartronic CVT transmission I was pleasantly surprised with the speed at launch and when overtaking slower vehicles on the street and on the highway. Power is rated at 148hp at 6,200rpm and 145lb.ft. of peak torque at 4,200rpm. Furthermore, my Sport Limited came with steering wheel paddle shifters that made driving the car even more exciting and enjoyable. Even more exciting is that all Subaru’s come with Symmetrical AWD system that uses Active Torque Split. An electronically managed continuously variable transfer clutch actively controls power distribution in response to driving conditions and wheel slippage. I never felt the torque changing from front to rear torque for fun seamless experience. 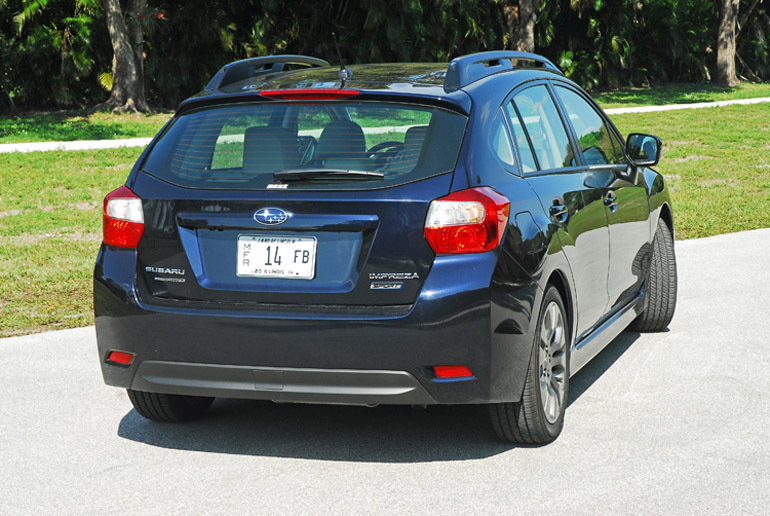 A focus on optimized construction helped reduce weight from the previous-generation Impreza, contributing to the greatly improved fuel efficiency. 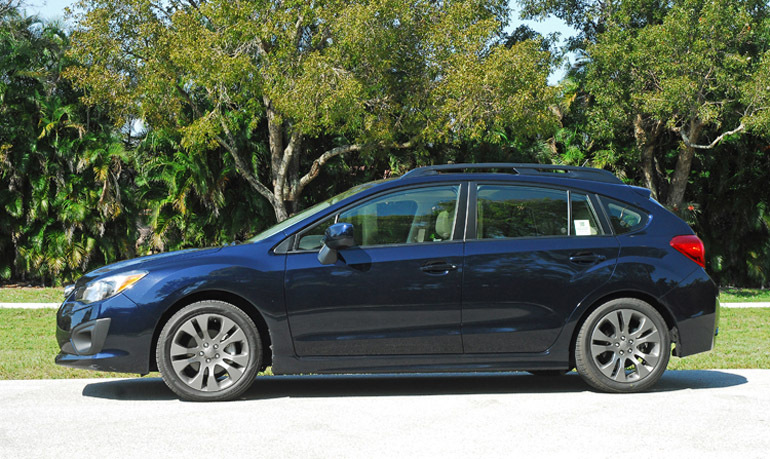 The 2014 Impreza models weigh less than some FWD compact models, yet high-strength construction preserves Subaru’s standard for safety, vehicle integrity and nimbleness. The fully independent suspension features strengthened components in front and in the rear to enhance agility, while liquid (hydraulic) engine mounts on models with the CVT help to damp out vibration. Up front is a MacPherson setup with lower L-arms, coil springs and a stabilizer bar. The rear is a double-wishbone setup with coil springs, gas-charged shocks and a stabilizer bar. The rear strengthened components along with pillow ball bushings improve the ride, straight-line stability and handling response. Responsive steering is made possible by the Rack & Pinion electric power assist that is calibrated spot-on for my Sport test model. It gave me quick response to my inputs with a very good on-center feel and a great feel for the road. 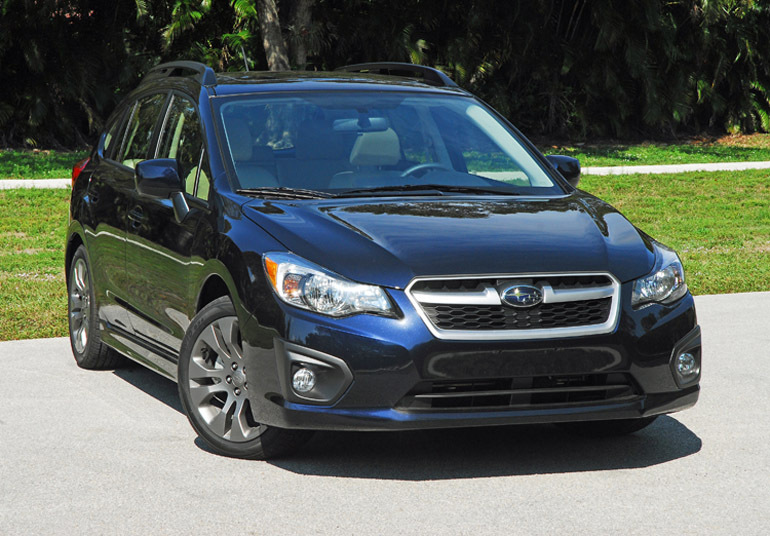 Slowing this five-door sporty edition Subaru down from speed are large, power-assisted steel disc brakes. Up front are 10.9 inch vented discs clamped with large, single-piston calipers and 10.8 inch solid discs in the rear clamped with single-piston calipers. Standard ABS, EBD, BA and all-speed Traction Control all work together to keep me and my passengers safe during severe braking maneuvers on wet or slick pavement. Also helping improve the ride and stability are the large 17X7 inch aluminum alloy wheels wrapped with 205/50R17 inch rubber. 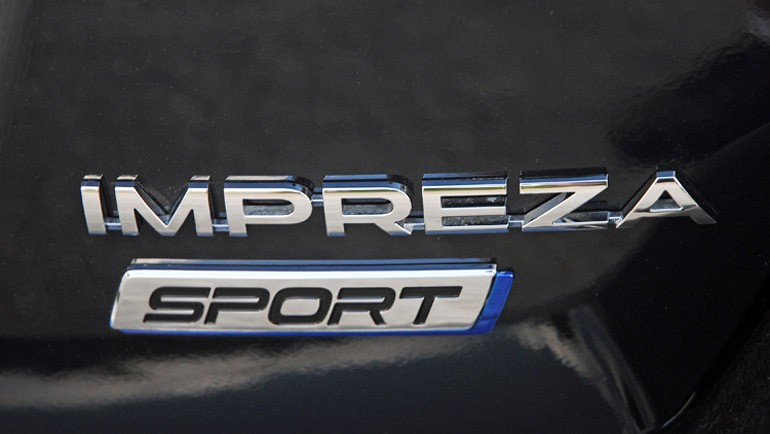 These great working mechanicals back up the bold sporty looks of the new Subaru Impreza 2.0i Sport Limited. An aggressive front fascia is highlighted by large headlamp clusters, wide aluminum grille with a wide centered aluminum bar with the Subaru logo, lower foglamps and spoiler to keep the front end solidly planted on the road. A more raked-back windshield and A-pillar bottom is moved 7.9 inches forward and front door opening nearly five-inches longer for easier entry/exit. The profile of the Impreza Sport Limited draws attention to its flared fenders and 17 inch alloy wheels as well as its large power-remote sideview mirrors, big pull-out door handles and thick black roofrails. The rear fascia features wraparound lamp clusters, a step-up bumper, an easy-to-open liftgate and spoiler at the end. The new-generation Impreza is the roomiest ever. 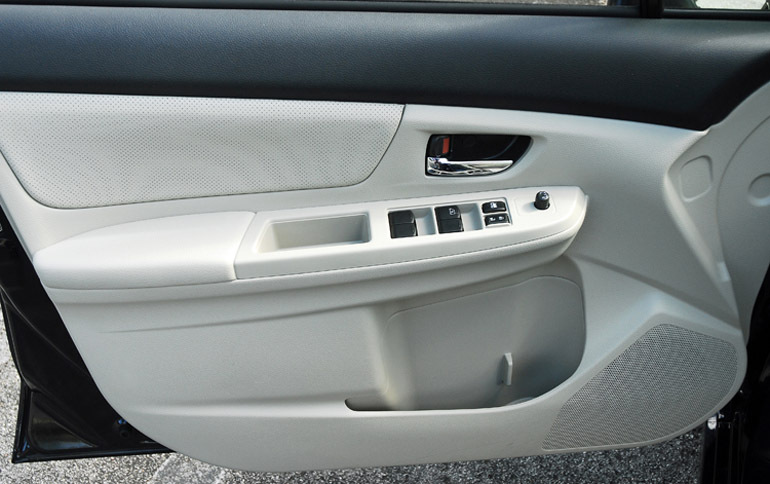 Vehicle length and width remain the same as before but because of a longer wheelbase-104.1 versus 103.2 inches, its redesigned door panels, the new generation Impreza has increased hip and shoulder room. Rear seat passengers gain nearly two inches of legroom. The Five-door model has 22.4 cu.ft. 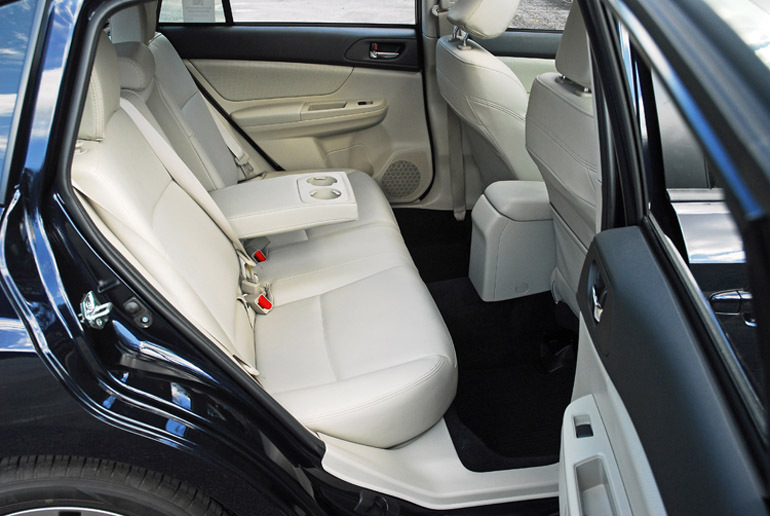 of space behind the rear seats that expands to 52.4 cu.ft. with the standard 60/40 split rear setbacks folded to create a flat load floor. 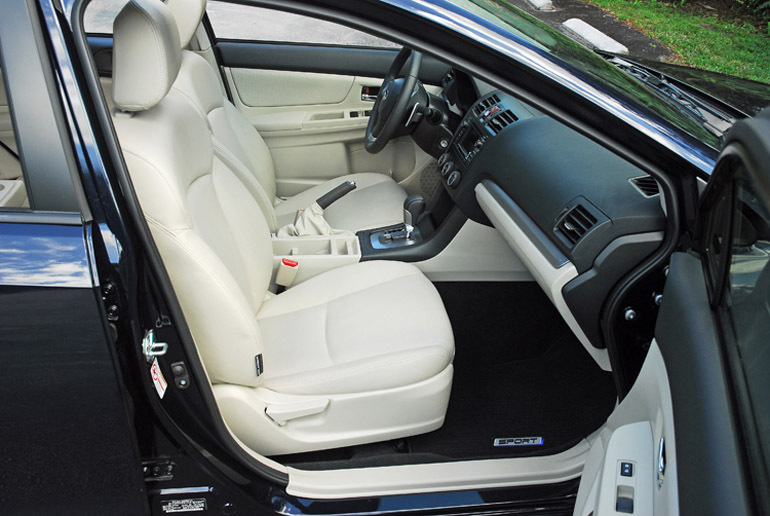 The front leather bucket seats are very comfortable and cut deep to keep my in place during high-speed cornering and my manual adjustable seat had a height adjustment. 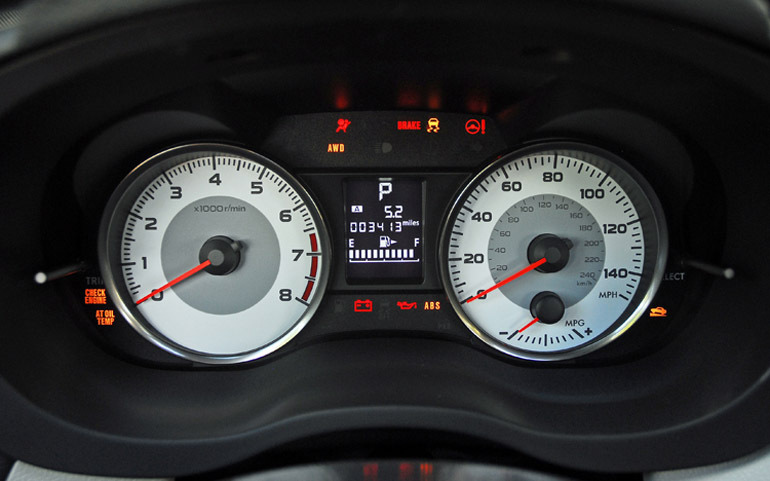 The instrument cluster features easy-to-read gauges with a smaller window in between with vital trip and engine performance information. The center stack is easy to reach and all buttons, dials and switches are fully illuminated for safe night travel. The leather-wrapped/tilt/telescopic steering wheel is sporty and feels great in my hand. Standard features in the Sport Limited model includes automatic climate control with air filtration, AM-FM-CD-HD audio system with 6-speakers with an Auxiliary input and steering wheel mounted controls, Bluetooth hands-free phone connectivity, USB port with iPod connectivity, Rear vision camera, cruise control, power windows with driver’s-side express up/down, center console with dual cupholders, storage bin and armrest, open storage bin under the center stack, power door locks, dual power sideview mirrors, leather-trimmed upholstery, heated front seats, grab handles above each door, variable intermittent wipers/washers/rear wiper/washer, dual map lights, dual vanity mirrors, pull-down rear center armrest with dual cupholders and storage slots in each door. 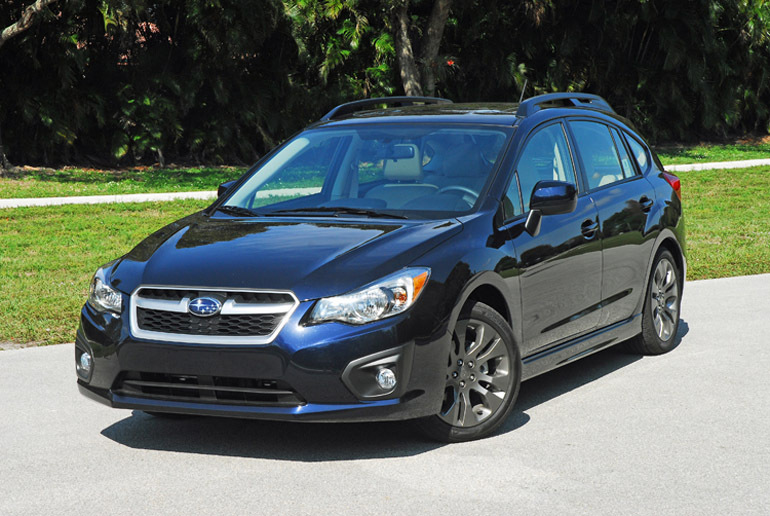 The only option in my test Impreza is the one-touch power moonroof listed for $1,000.00. Standard safety systems include Subaru Advanced Frontal airbags, front seat side-impact airbags, side-curtain airbags, driver’s-side knee airbag, safety pedal system, tire pressure monitor system, 5-3-point safety belts with front pretensioners/load limiters, Ring-Shape Reinforcement Frame Design, anti-theft alarm/immobilizer and Daytime Running Lights. 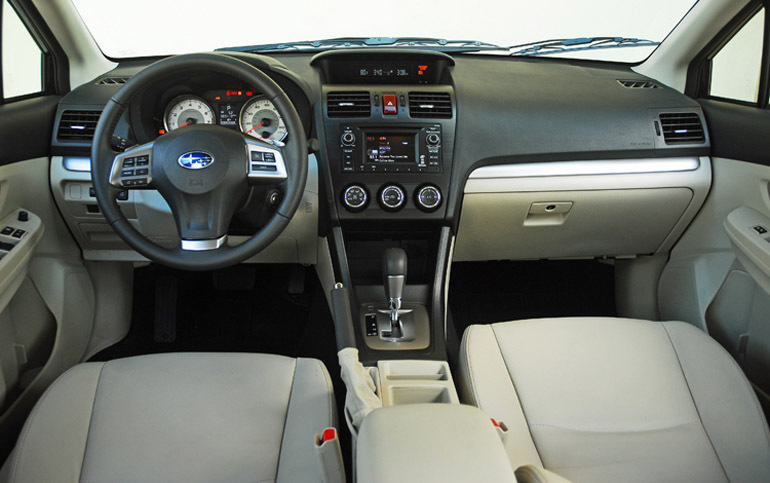 The new 2014 Subaru Impreza 2.0i Sport Limited has it all to keep active singles, couples and young families happy to be owners of this well-appointed, agile, fuel-efficient and very safe compact five-door hatchback. The base price starts at just $23,195.00.